I have tried Erin Baker's products in the past and really enjoyed them. I contacted the company again to try some more of their products and was sent some of their breakfast cookies and a sample of granola. The first product that I tried was the mini breakfast cookie in peanut butter. This cookie is soft and tasty. It did not have a strong peanut butter flavor but was good. It is a perfect treat if you are not too hungry but need something. I like eating these for a mid-morning snack after my breakfast. 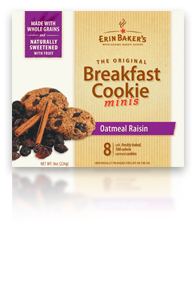 The next one that I tried was the oatmeal raisin mini breakfast cookie. It has 100 calories, 1.5 grams fat, 2 grams fiber, 2 grams protein and 7 grams of sugar. Not bad! It is full of ingredients like whole-grain oats and wheat flour. It is sweetened with prune puree which is healthier than only sugar. The last product that I tried was the granola. One small package contains 8 grams of protein and 630 milligrams of omega-3s. It was very tasty too! I would throw this over yogurt or add some milk to it. The giveaway will be for one mixed sample kit from Erin Baker's.